The massive display is complemented by a 7-inch touchscreen built into the steering wheel and an 8-inch touchpad between the front seats. 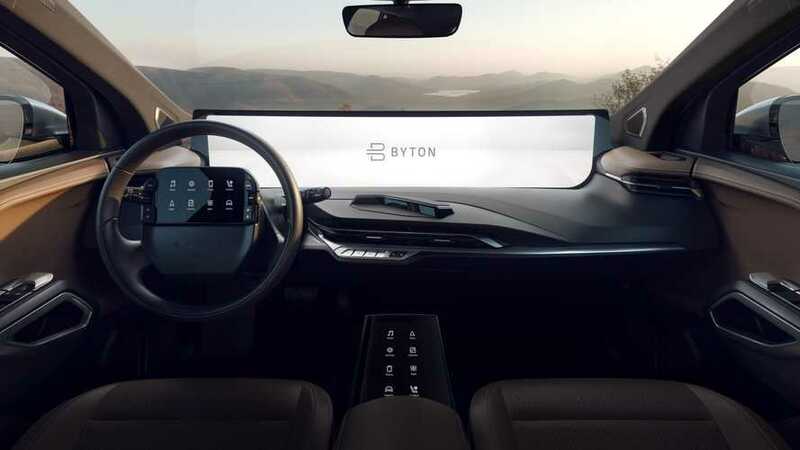 Chinese startup Byton took the automotive world by surprise last year at the Consumer Electronics Show where it exhibited the M-Byte concept with a gargantuan touchscreen display for the infotainment system. For this year’s show in Las Vegas, the company decided to unveil the production-ready cabin of its electric SUV, complete with an expansive 48-inch display or a bit wider than seven iPads put side by side. Tesla’s 17-inch screen doesn’t look so big anymore, does it? Dubbed the “Shared Experience Display” (SED), it’s by far the largest screen you will find in the automotive industry and stretches from one A-pillar to the other. 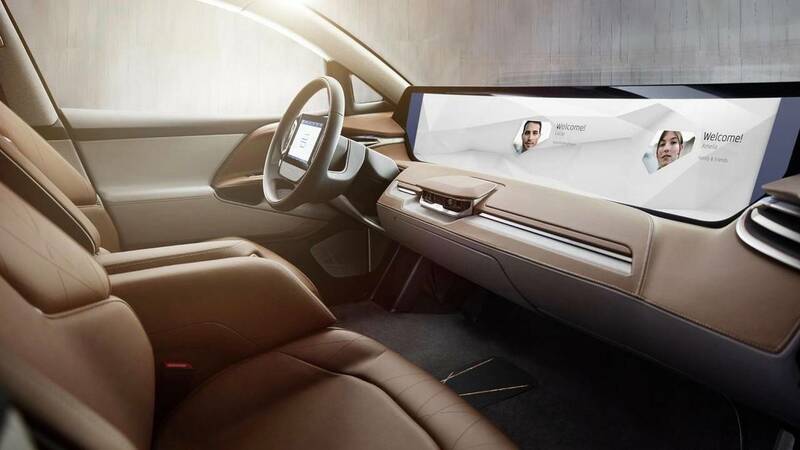 While at a first glance it might seem distracting because of its sheer size, Byton mentions it does not interfere with the driver’s line of sight. The Chinese automaker mentions the SED complies with all safety and crash standards in all the markets where the M-Byte will be sold. Here's a comparison between the 2018 concept (left) and the 2019 production version (right). You’d think such a giant display would be more than enough for the interior of a car, but there’s another one incorporated within the steering wheel. Located just above the driver’s airbag, the 7-inch touchscreen allows the person behind the wheel to configure the car and go through the functions offered by the SED. But wait, there’s more. Compared to the concept shown 12 months ago, the road-going EV has gained an 8-inch touchpad mounted between the front seats so that the passenger can play with the SED and its numerous features. Because there’s no such thing as having too many screens inside a car, the passengers sitting in the back have their own displays linked to the infotainment system. That brings the grand total to five screens. Screens aside, this is still first and foremost an EV. A full reveal of the Byton M-Byte production version is programmed for the middle of the year ahead of production start towards the end of 2019 at the Nanjing plant in China. Buyers will get to pick between a 71-kWh, 250-mile base model estimated to start at $45,000 and a more expensive 95-kWh, 325-mile variant. The M-Byte electric SUV will be available at first in homeland China, with North America and Europe to follow in 2020. It is not about refining cars. It is about refining life. BYTON aspires to build premium intelligent electric vehicles for the future. Its crafted cars integrate advanced digital technologies to offer customers a smart, sage, comfortable and eco-friendly driving and mobility experience. BYTON aims to create a premium brand rooted in China which has a global reach. Its global headquarters, intelligent manufacturing base and R&D center are located in Nanjing, China, while its North American headquarters, devoted to intelligent car experience, autonomous driving, whole vehicle integration and other cutting-edge technologies, is based in the Silicon Valley. The company's vehicle concept and design center is located in Munich. BYTON also has offices in Beijing, Shanghai and Hong Kong to handle external affairs, marketing, sales, design and investor relations. BYTON's core management team is made up of the world's top experts from China, Europe and the U.S., all of whom have held senior management positions in innovative companies such as BMW, Tesla, Google and Apple. Their expertise covers automotive design, automotive engineering and manufacturing, electric powertrain, intelligent connectivity, autonomous driving, user interface and supply chain management among other industry sectors, the sum of which represents BYTON's strengths in manufacturing premium automobiles that are equipped with high quality internet technologies.